The City of Cannon Beach limits us to one guest reservation every 14 days, so Paradise View has limited check-in and check-out dates. You may use the online booking function to make a reservation, or please call the CBVR Office at (503) 436-0940 if there are questions. Thank you! A breathtaking panoramic view from this 3 BR + 3 Bath home awaits you. An expansive wrap around deck and West-facing walls of glass on each level let you enjoy the view from inside or out. Enjoy glowing sunsets next to the fireplace or from the deck. An open main floor with an open kitchen, dining room, living room, and two comfortable bedrooms with two full baths is perfect for entertaining. The lower level is a recreation area complete with a pool table, loads of games, one full bedroom, two bunk rooms, a full bath, and washer/dryer. With good access to the beach, a million dollar view, and only a mile from town, you are certain to enjoy the best of what Cannon Beach has to offer! 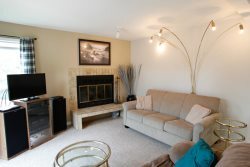 Cannon Beach Vacation Rentals offers these nearby homes: Beach Bijou, Purdy House, and Standing Stones. A good value for a large family stay. You guys rock the vacation market. Home was absolutely wonderful and accommodating. Location was priceless - and view was spectacular! We felt like we were "at the beach" even staying indoors! The 70's style home was retro and fun! We appreciate your comments and will inform the homeowner your thoughts. Sorry things were not up to your expectations and hope that you will come back to CBVR again soon. They were very helpful. Great attitudes and I was thankful that they were available to help. We had a wonderful time as a family and enjoy good company food and fun. The view from our location was fantastic the house was great except the furniture was a drawback we made it work. It was a comfortable home that was very welcoming for a family vacation. Just at check in and out. Friendly, wanted to make sure all was ok.
Open area makes it family friendly. View is great even on a cloudy day.